This Dairy Free Taco Casserole is the perfect dinner for a family or dish a crowd. 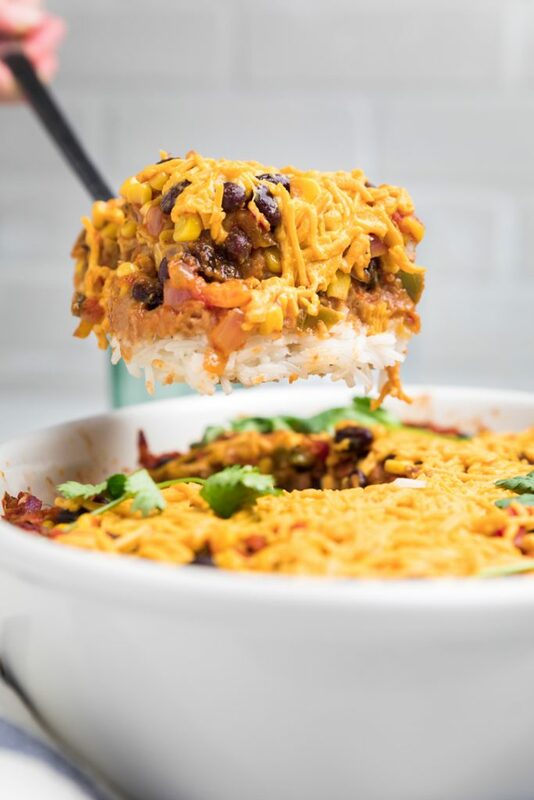 This layered vegan taco casserole comes together in just minutes and is ready in under 45 minutes total. Completely customizable, Top 8 Allergen free! Whether you’ve been dairy free for a few days or years, one thing always happens. You have no idea what to make for dinner. Whether you are cooking for one person or a whole family, there’s only so many ideas you can come up with. Scouring on Pinterest sometimes leads to good results and if you found your way from there to this recipe, I’m going to let you know that you found a winner. 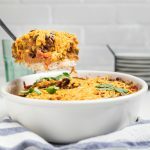 This delicious dairy free taco casserole is one of the best dinners recipes that you can have in your arsenal. This easy taco casserole recipe is a hit for get togethers and crowds, like hosting a football game watch party or your next potluck get together. 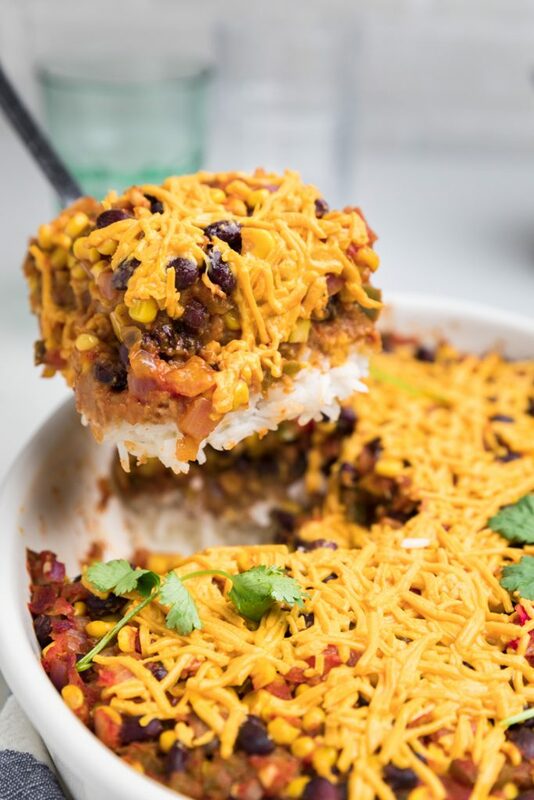 No matter what the reason, this vegan taco casserole should be on rotation in your house. 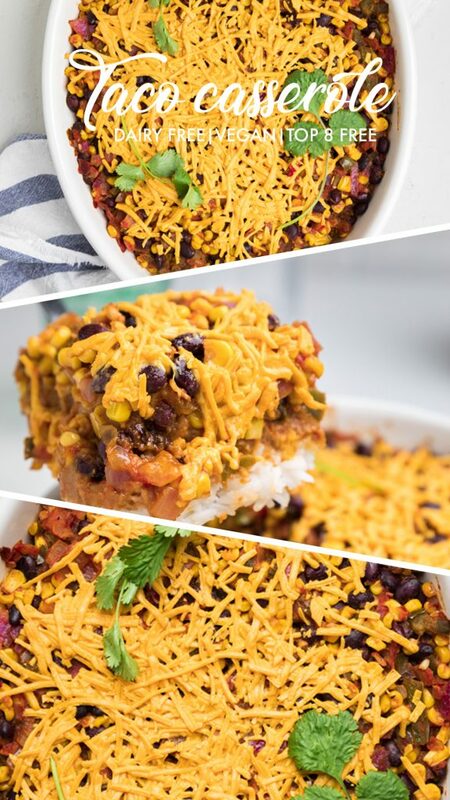 What’s even more amazing about this dairy free taco casserole recipe is completely customizable. While the recipe calls for a specific set of ingredients listed below in the recipe, if there’s something that you don’t like, you can simply omit that part of this layered taco casserole. And of course, if there is a specific ingredient that goes along with Spanish/Mexican cuisine that isn’t included, you can totally add that into the recipe too! 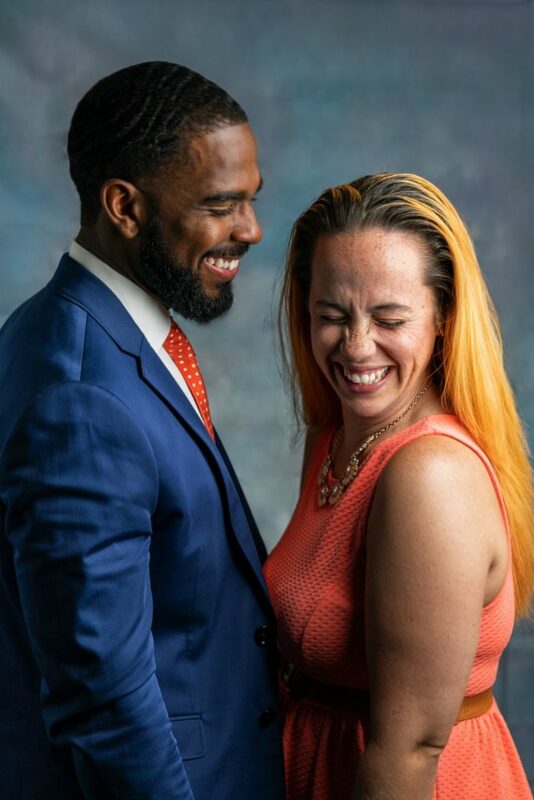 It’s a win/win for everyone. What ingredients do you need to make a dairy free taco casserole? You’ll also need avocado and tortilla chips with serve with the dairy free taco casserole. 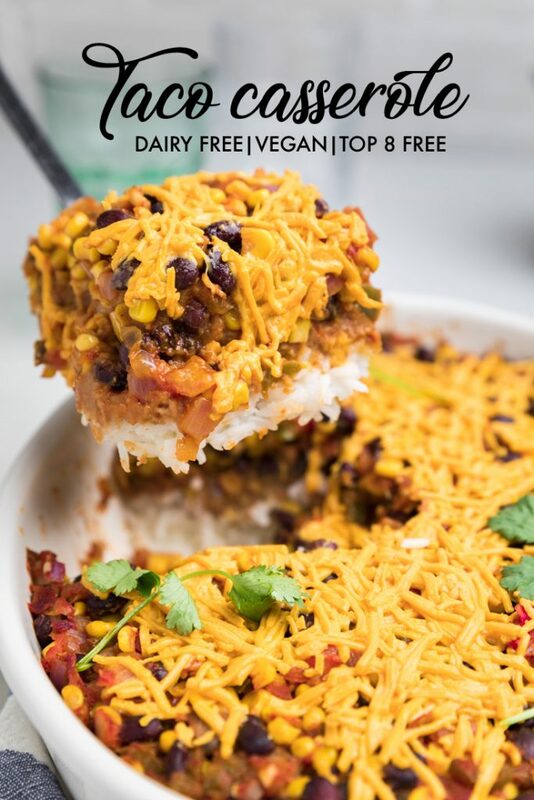 How do you make a dairy free taco casserole? This dairy free casserole takes under 45 mins to get on the table, but it can be even quicker than that. The first step is to cook your rice. You can use brown rice or white rice, Spanish style or plain. It’s completely up to you. 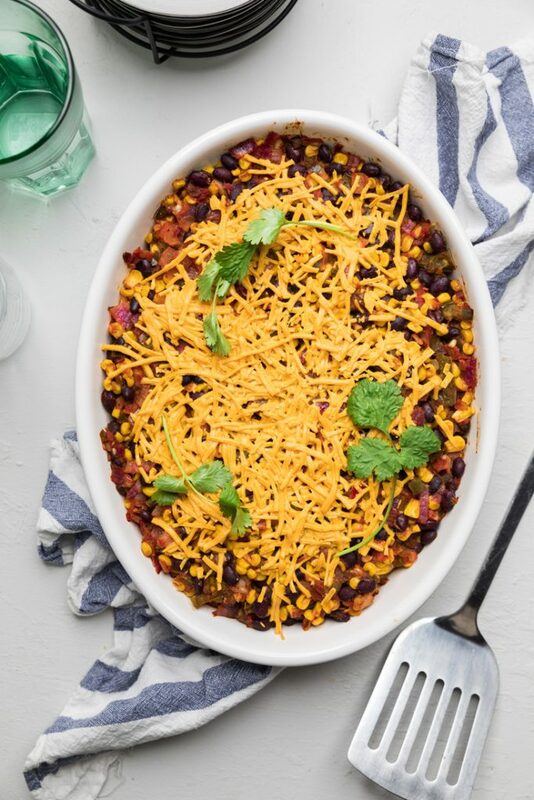 We often switch up how we’ve made this dairy free taco casserole, but either way it’s a hit. You can use between 2-3 cups of cooked rice for this easy taco casserole recipe. If you need it to go further, add the full 3 cups. One way to make this recipe cook quicker is to prep the rice earlier in the week and that way it’s ready to go. While you wait for the rice to cook, heat up some olive oil in a large skillet and add to it the peppers, onions and garlic until translucent. Then, add in the black beans, corn, taco seasoning and salsa. Stir together until combined and heated through. Turn off heat. One you have your cooked rice, spread it evenly across the bottom of a 9×13 casserole dish. Next, carefully spread a can of refried beans, warmed, across the rice. Then top with the bean mixture. Lastly, spread dairy free cheese across the top. Bake in preheated oven at 350 F for 20 minutes or until dairy free cheese on top has melted. Remove from oven. Top with cilantro if desired. Let cool for 10 minutes and serve with avocado and additional salsa on the side. 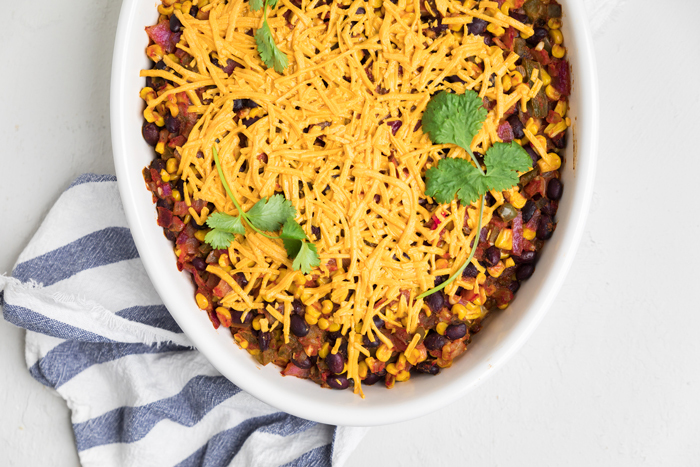 Serve this dairy free taco casserole with tortilla chips for dipping. Cook your rice according to package. *See tips in post above about types of rice to use. While rice is cooking, heat 2 tbsp olive oil in a large skillet and saute the peppers, onions and garlic over medium heat until translucent (2-3 minutes). Spread cooked rice evenly across the bottom of a 9×13 casserole dish. Next, carefully spread a can of refried beans, warmed, across the rice. Sprinkle dairy free cheese evenly across the top. Top with cilantro if desired. Let cool for 10 minutes and serve with avocado and additional salsa on the side. *Nutritional values do not include optional toppings and sides. *This dish is customizable. Don’t like refried beans? Omit this. Can’t have corn? Double up the beans. Enjoy! I was wondering how much salsa you are adding into the bean and pepper mixture? I don’t see it listed in the ingredients! Thank you 🙂 Can’t wait to try this out tonight! Wow, good catch. So sorry for that error. I’ve updated the post. It’s 1 cup.